← Settle Orchestra is now on YouTube! Under the baton of their new conductor, Alexander Webb, Settle Orchestra transported their audience away from the Dales to a dark and stormy place on a wild sea voyage to the Hebridean shores of Staffa to view the phenomenon of Fingal’s Cave. Since its debut in 1832, Mendelssohn’s Hebrides Overture has always been popular as it recreates the journey to the remote and majestic cave, complete with the power of the storm experienced on the sea crossing. It was clearly a favourite of the orchestra who performed with great concentration and enthusiasm throughout. Particular mention should be made of the outstanding work by the strings section and the two solo clarinets who created a stunning contrast, effectively capturing the moment where the storm retreats in the face of a shaft of sunlight. This was a powerful and effective opening to the concert and showed that working with a new conductor has clearly once again reinvigorated the orchestra. There was more musical storytelling in the second half of the programme, with Beethoven’s ever popular Symphony No 6 – better known as the Pastoral symphony. This is a wonderful piece full of joyous and playful moments and also passages of great theatricality. It also is a perfect piece to demonstrate the way in which the orchestra works seamlessly together, each section having an opportunity to shine while creating a varying array of moods. The piece began with a positive explosion of activity which then fades only to return more strongly than ever, creating a great sense of liberation as the day in the countryside begins. This was followed by the slower passage recreating a stream, giving opportunity for some wonderful playing by the two cellists and the woodwind section. Special congratulations to the trio of “bird songs” on flute, oboe and clarinet at the end of the movement. The third movement gave a chance for many in the orchestra to have fun, with lots of lively fingerwork on show. This was followed by a storm, in which the real star of the evening was Clare Dunn on timpani, before a delightful closing movement restores tranquillity once more. However, these two were not the only joys on offer as the orchestra was joined by cello soloist Thomas McMahon for a stupendous performance in Saint-Saens Concerto No 1. 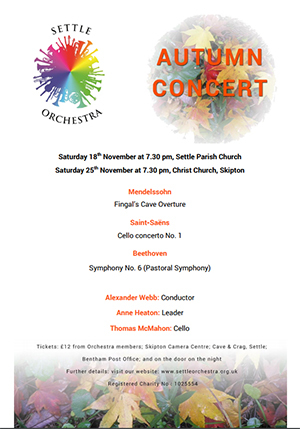 This was a magnificent experience with both an amazing soloist and the orchestra working together wonderfully to create a very special performance in a programme which produced an evening of delights.